This is a 22 mm Green Panel Mount Push Button. 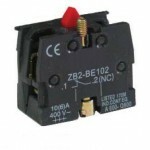 This push button can be used with Normally Open (NO) Element or a Normally Closed (NC) element. These push button along with the required element can be used to control the electromagnetic starter, contractor, relay and other automatic control electric circuits. Button Diameter: 2.5 cm/ 1"
This is just a Push Button without the switching Element. Switching Element you have to order separately as per your requirement.